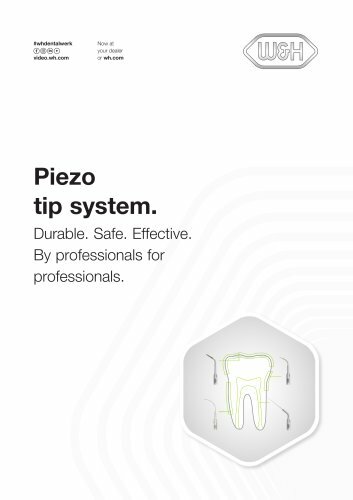 PEOPLE HAVE PRIORITY PEOPLE HAVE PRIORITY Prophylaxis & Periodontology Piezo tip system. By professionals for professionals. The W&H tip system has been developed in consultation with end users and specially designed for the technical requirements of W&H piezo technology. It is perfect for the requirements of the respective application areas and the individual treatment steps. Fast, simple and safe handling The W&H tip changer allows fast and safe handling.The integrated torque control prevents overtightening and leads to a safe and simple tip change. Hygiene and Maintenance All tips and the tip changer are thermo washer disinfectable and sterilizable. Universal tips Simple, gentle and efficient supragingival calculus removal in all quadrants. 1U For coarse depuration of supragingival calculus. 2U For fine depuration of supragingival calculus, as well as for the treatment of recall patients. 3U For polishing to remove supragingival calculus, particularly suitable for interdental cleaning. 4U For coarse depuration of supragingival calculus, in particular for the removal of large areas of calculus. Periodontology tips Its slender design facilitates optimum and also atraumatic access to the periodontal pockets. For supportive periodontitis treatment (SPT), recall and biofilm management. 3Pl Left angled perio tip. Recommended for maintenance of moderate and deep pockets and furcations. 1P Removal of subgingival deposits, particularly suitable for deep periodontal pockets. 1I Implant-clean Tip for the efficient and careful cleaning of implants and the attendant restorations. 3Pr Right angled perio tip. Recommended for maintenance of moderate and deep pockets and furcations. Periodontology tips Diamond-coated tips for thorough cleaning of the root surface during the initial treatment of periodontitis affected patients. For initial periodontitis treatment and removal of concretions. 5Pl Left angled tip with diamond coating for efficient cleaning of the root surface. 4P Diamonded tip for efficient cleaning of the root surface. 5Pr Right angled tip with diamond coating for efficient cleaning of the root surface. 5P Diamonded tip for efficient cleaning of furcations and concavities. Endodontic tips W&H offers the perfect range of endo tips whether for flushing a root canal or complex revision in an endodontic patient. 1E Non cutting instrument for the irrigation at the end of the root canal preparation. 4E Preparation of the pulp chamber. 2E Tip for the lateral condensation due to thermal effect. 5E Vibrating and removal of root canal posts. 3E Removing of broke instruments in the root canal. 6E Removal of root canal fillings and root canal calcifications. Restoration tips The tips are the perfect addition to your straight and contra-angle handpieces. Due to the diamond coating a high abrasion performance is achieved. 2R Diamond tip. Preparation of the veneers for clearly defined edges of preparation with maximum protection of the adjacent tooth. 3Rm Partly diamond coated tip. Preparation for the of the mesial surface. 3Rd Partly diamond coated tip. Preparation for the of the distal surface.